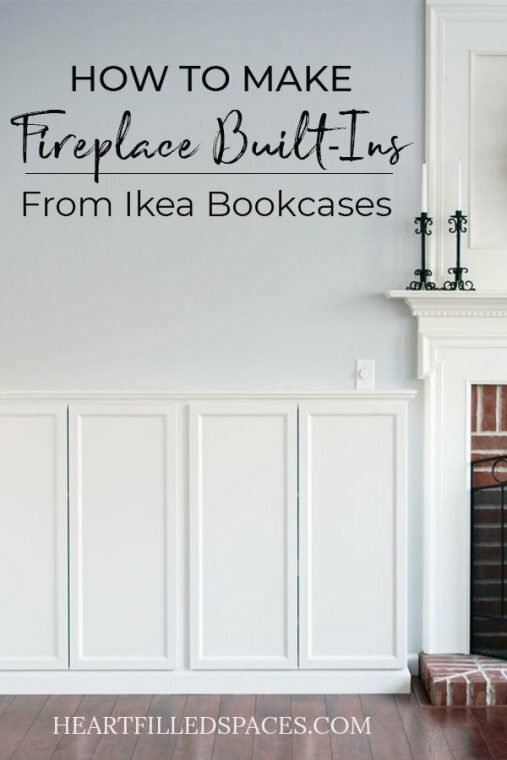 I’ve been working on updating my living room one project at a time and I’m so excited to share this tutorial with you on how I created my DIY Fireplace Built Ins with Ikea Billy Bookcases. 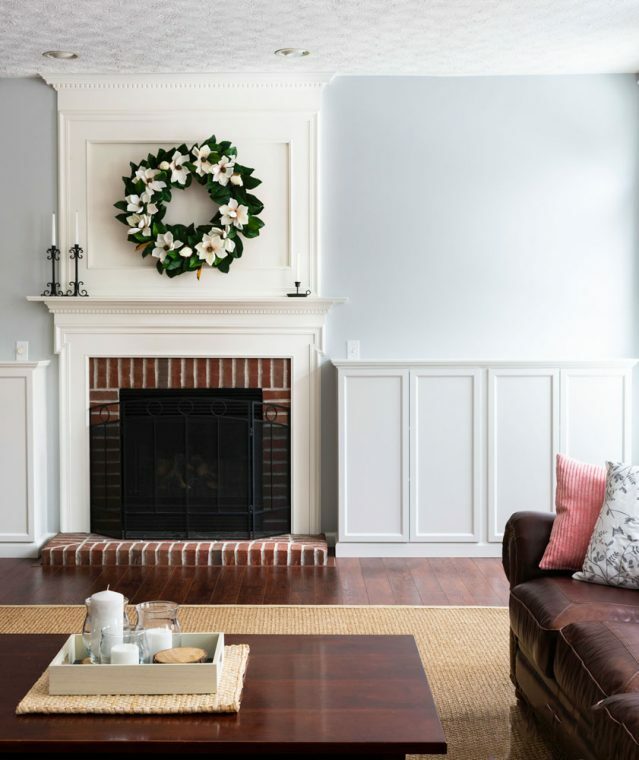 For my tutorial on building a DIY Overmantle you can click here. This space had a few trouble spots that I had to work around. First, my mantle is flush with the wall. 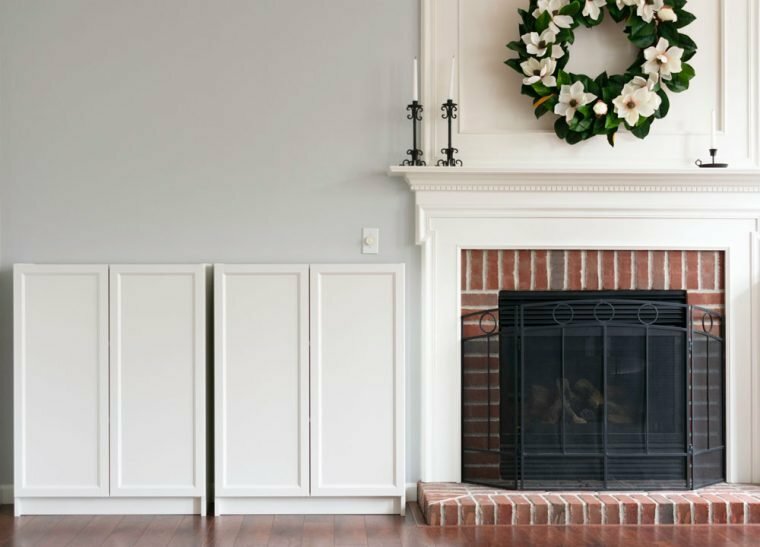 I did not want to build large bumped out cabinets from floor to ceiling as this would take away from the fireplace being the focal point of the room. Eventually I will add floating shelves or some other decorative item over the cabinets to give them a more finished look. There is a window on the right side of the room, which prevented me from bringing the cabinets flush to the right wall and I have two wall switches that I did not want to move up. So I designed this space using 11 inch deep cabinets with the final height of 43 3/4 inches tall. I left a gap on both sides to compensate for the window and keep them symmetrical. Finally, I got around to working on them. The first step was to place the cabinets exactly where you want them on the wall. Measure for spacing. Then mark the position for the wall anchors through the inside of the cabinet. Move the cabinet and mark the studs with a stud finder. If no stud is available, drill a hole slightly smaller than your anchor and tap it into the wall. Place a washer onto the screw and drive the screw through the “L” bracket and into the anchor. The “L” brackets, screws and washers came with the cabinets. If you have a wall outlet now is the time to measure the location and cut it out with an oscillating cutter. Slide the cabinets back into place, feeding the anchors through the holes in the back of the cabinets. 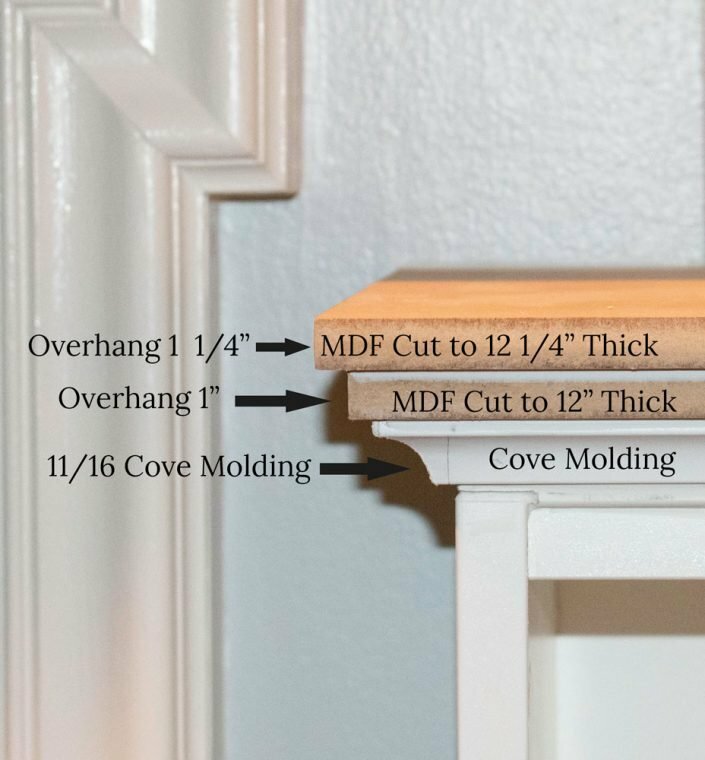 If your base molding is 3 1/4″, the bookcases will fit over top of them. 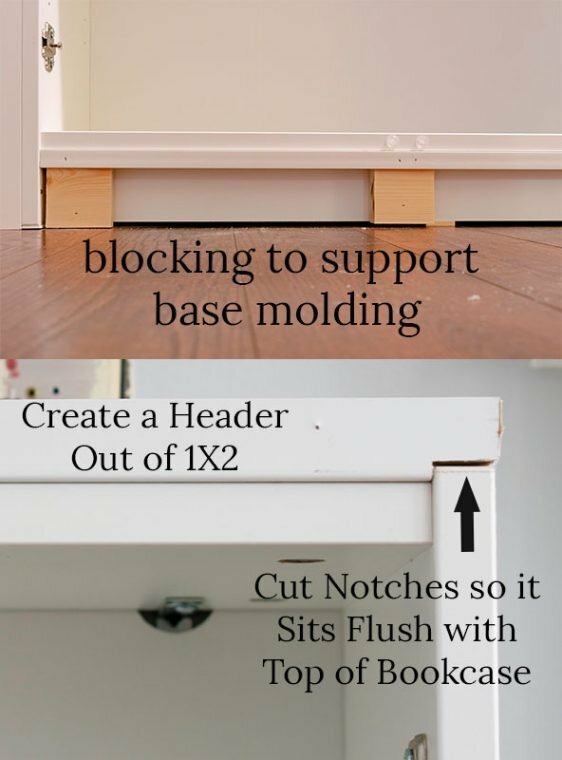 If they are taller, you can build a platform under your cabinet or remove the base molding. 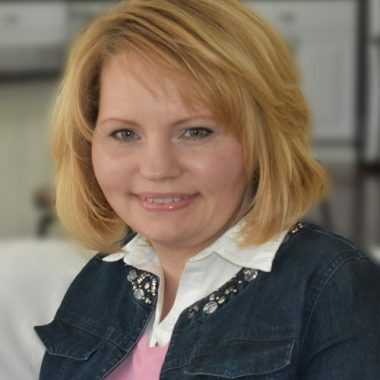 Check the top of your bookcases for level. I had to place shims under them to bring them to level. (Image 1 Below) Now you can fasten the “L” brackets to the inside of the cabinets. 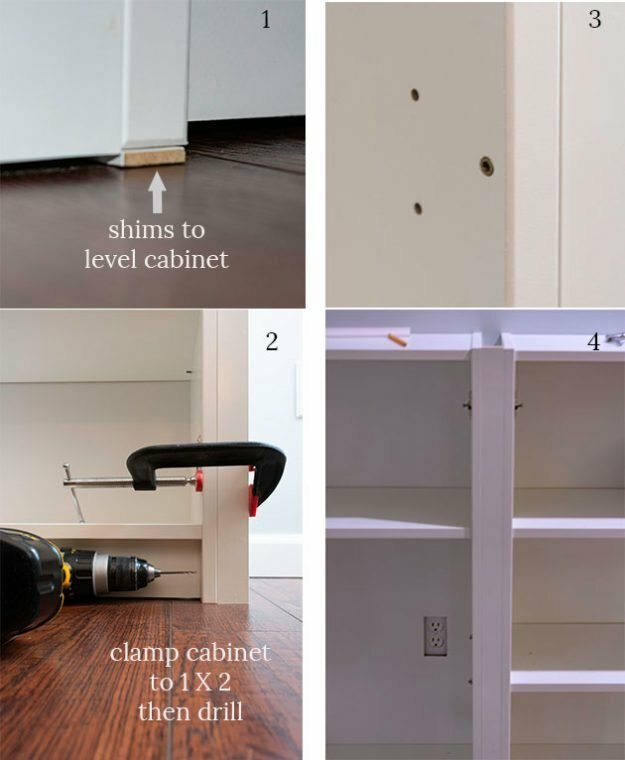 Attach the 1 X 2 to the cabinet with a clamp and drill a hole a little smaller than your cabinet screw. (Image 2 Above) My favorite screw to join cabinets together are these. These trim screws go in so nice and countersink themselves. (Image 3 above) I attached each side of the cabinet with three screws. I added some blocking under the cabinets to support my base molding. (See image below) I also added a thin strip of wood to fill in the gap at the top of the base molding. Then I measured and cut my moldings. The ends of the new base molding were cut to fit over the old ones and caulked. Finally, I installed them with an 18 gauge brad nailer. 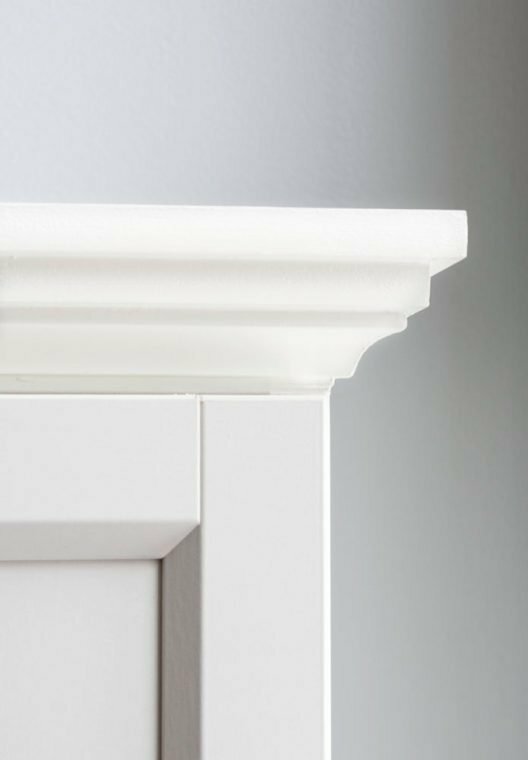 I notched out the header piece of molding so it fit flush with the top of the bookcases. (See Image Above) I wanted to bring them up to a specific height and add a thick crown type look to the top of the bookcases. Then I glued and attached them to the bookcases. One in front, one in back and three short pieces for support down the middle. This created a rectangle to place my MDF on. The nice guys at Home Depot cut my MDF into (2) 12″ X 8′ strips and (2) 12 1/4″ X 8′ strips. Then I brought them home and sanded the edges smooth and nailed them into place. (See Image Below) Lastly, I added the cove molding. Finally, I caulked all of cracks and filled all nail holes with wood filler. 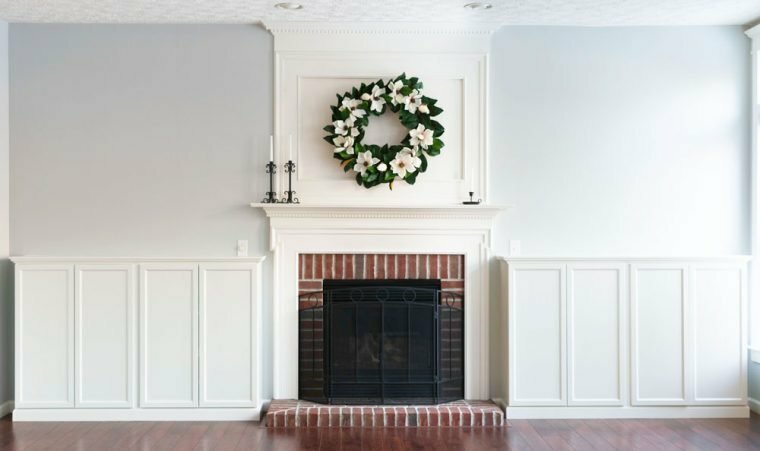 The MDF was primed and then painted with two coats of Behr Snowy Pine. The color is not an exact match, but it was good enough for me. You may want to take one of the doors and have it color matched at Home Depot. I’m looking forward to organizing all that extra storage and decorating! Let me know what you think in the comments. Is this a project that you would tackle? Did this give you some ideas? 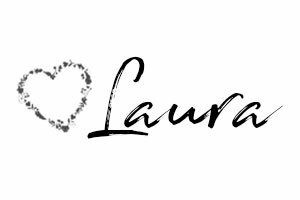 I hope you found it helpful!